iRealHousewives | The 411 On American + International Real Housewives: Tamra Judge Says Her Ex-Husband Simon Barney Refuses To Let Their Daughter Sophia Appear On RHOC! Tamra Judge says her ex-husband Simon Barney is blocking their daughter Sophia from appearing on The Real Housewives of Orange County. On Wednesday, April 3, Judge shared a text exchange with her thirteen year old daughter, in which the teen expressed disappointment in being excluded from appearing on show's upcoming fourteenth season opening intro. In the text messages, Sophia asks her mom how the shoot went, and Judge replies, “It was okay,” sending a photo featuring husband Eddie Judge and her older son Ryan Vieth, from a previous relationship, and their dog Bronx. 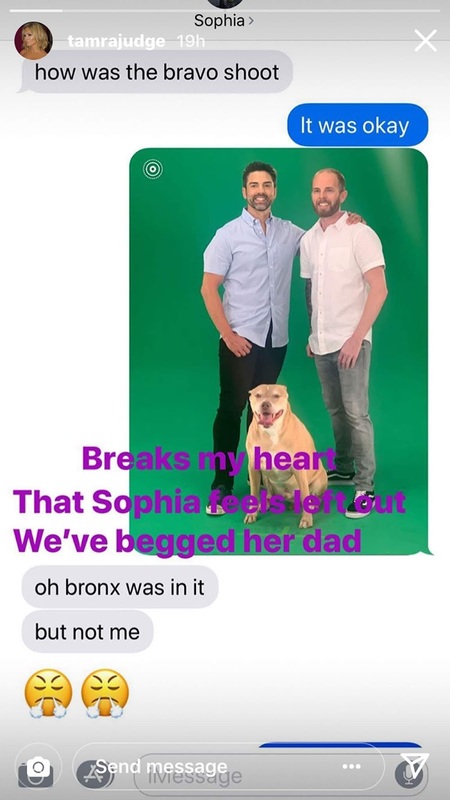 “Oh Bronx was in it but not me,” Sophia replies along with two angry-faced emojis. Barney filed for divorce from Judge in January 2010 after nearly 12 years of marriage in a split that quickly turned ugly, as he claimed she cheated on him - which she denied, reports PEOPLE. Their split also sparked an ugly custody battle, with Barney attempting in April 2014 to gain full custody of their three children Sophia, Spencer and Sidney, from whom she is estranged. However, hiss request was ultimately denied, though he did receive custody of Sidney after she chose to live with him full-time. Last fall, Judge revealed that her son Spencer would be appearing on RHOC, as he recently turned 18 and is now a legal adult.. His 18th birthday celebration was featured in a November episode that Judge said was “extra special” to her, as he had not been featured on the series since his 7th birthday, reports PEOPLE.